Arbat - the oldest pedestrian street in Moscow, originally the Smolensk road, is preparing for its 520th anniversary. All of the reorganization activities will be held October 1st to 6th, 2013, right after the Day of the City celebration on September 7th. Actually, today's Arbat has partially lost the historic atmosphere that attracted Moscow's intellectuals for many centuries. Today tourists and locals find it hard to enjoy the building facades and read the numerous historical plaques because of the abundance of advertising, signs and outdoor cafes that have appeared. In honour of the anniversary, Moscow authorities promised to transform the Arbat by removing the advertising and updating the pavement and building facades. The total cost of the project was revealed to be more than $10 million. Most of the funds will be spent to replace street pavers and improve other public amenities. The famous Arbat street lights will not be touched. Musicians and artists will now be "subject to licensing." Moscow authorities will allow them to work in specially designated areas only if they have a license. The Arbat has survived several other "rebirths" - for example, a fire in 1736 almost completely destroyed the buildings of that time and the street was rebuilt. Elegant mansions and estates of the nobles, merchants and officials lined the Arbat, turning it into what was already at that time one of the most prestigious and expensive areas in Moscow, which it remains to this day. Many buildings did not survive to the present, for example, the church of Nikolai the Miracleworker in the name of the Protection of Our Most Holy Lady, which stood on the corner of Arbat and Serebryany Pereulok, and was torn down in 1846. In the nineteenth century the Arbat became not only the cultural heart of Moscow, but attracted Moscow intellectuals as well. Along the main pedestrian street one can find museums, famous architecture, and theaters such as the Vakhtangov State Academic Theater, the Chekhov Theater, and others. Songs, poems and movies have been dedicated the Arbat, the oldest Moscow street (dates back to the 14-15th centuries) with many centuries of history. The Arbat is mentioned in the writings of Pushkin, Lermontov, Esenin, Tsvetayeva, and others. Bulat Okudzhava, the Soviet poet and composer, wrote memorable lines about the Arbat 40 years ago in a song that is beloved by all Muscovites: "Oh Arbat, my Arbat - you are my homeland... you're my calling." 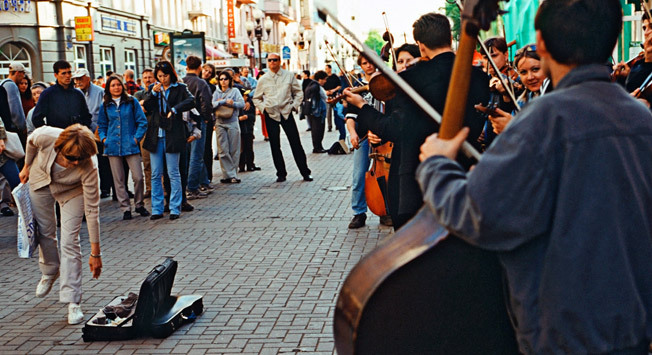 Today the Arbat is an opportunity to immerse oneself in the creative spirit of old Moscow, listen to street musicians, buy original souvenirs, and take a leisurely walk from Arbat Gates to Smolenskaya Square. Stop by the restaurant's bakery and buy a Prague cake (starting at 732 r ($22), a Ptiche Moloko (Bird's Milk) cake (from 756 r ($22.50), or pastries (starting at 25 r ($0.75)). Be sure to visit the bakery of Moscow's oldest restaurant, which opened in 1902. The restaurant has six halls, a buffet, 18 individual rooms and a few billiard tables. Artists, musicians and writers frequented Prague restaurant, including Tolstoy, Bunin, and Kuprin. Prague restaurant is famous for its culinary masterpieces. During the Soviet period, people lined up at night not only for the Prague cake, but also for the legendary patented "Ptiche Moloko" (Bird's Milk), invented by a Moscow pastry chef and unique in world cuisine. Attend the "Captivating Russian Romance Won't Fade Away" concert on September 24th.Tickets from 120 to 3000 r ($3.50 to $90) with tour. Aleksandr Pushkin brought his young wife Natalia Goncharova to this house, one of the oldest buildings on the Arbat (18th century), after their wedding on February 18, 1831. "I am married and happy," he wrote. "My one wish is that nothing in my life will change; I don't expect anything better. This is such a new feeling for me, it seems like I have been reborn." The Pushkin Memorial Apartment on the Arbat was opened in 1986. Tickets can be purchased at parter.ru , at the theater's ticket office (150 to 6500 r ($4.50 to $194), and on the theater's website . It is impossible not to notice the large building with pillars in the very heart of Arbat street -- the Vakhtangov Theater. The theater has been around since 1921 and in 1926 it was named after its artistic director Yevgeny Vakhtangov. The theater is beloved by generations of Muscovites for its talented actors and directors and for the diversity of genres it presents -- from the classics (Anna Karenina and Evgeny Onegin) to experimental theatre. The theatre is affiliated with the Museum Apartment of Vakhtangov (Denezhy pereulok 12). Performances only in Russian. Today the theatre is preparing for the opening of its 93rd season on September 5th with the play Pristan (The Pier), which is dedicated to the 90-year anniversary of the theatre. Feel the romance of the historical centre of Moscow. While standing near the theatre, do not miss your chance to see the Princess Turandot fountain (1997), which was dedicated in honour of the last Vakhtangov production in 1922. The fountain was erected with the support of the Moscow city government for the 850th anniversary of the capital. In the evening the fountain is illuminated, creating a romantic atmosphere for couples strolling along the Arbat. "Touch" the Soviet period by leaving a note or an inscription on the wall, even if you aren't an artist. The Arbat is a place where the present and the past collide. "The Wall", a phenomenon of contemporary art, appeared in 1990 after Viktor Tsoi, Soviet rock singer and founder of the group Kino, died in a car accident. Viktor Tsoi left a musical rock legacy for the many fans who still today come to Krivoarbatsky pereulok to remember the words and the music of Tsoi, look at the graffiti, and meet other fans. Apartment Museum of Marina Tsvetayeva , Borisoglebsky per. 6. See the fireplace and the family's beloved Pasternak sofa in the living room on the first floor, where Tsvetayeva often received inspiration. To buy tickets for an independent visit or guided tour go to www.pÐ¾nÐ¾minÐ°lu.ru (100 to 2000 r) ($3 to $60). Marina Tsvetayeva, a great poet of the 20th century, lived in this apartment until she emigrated. The cultural centre was officially opened in 1992, 100 years after Tsvetayeva was born.